Moving On: Project Helps War Widows Recover The Defense Department says the Iraq and Afghanistan wars produced 3,200 military widows and widowers. This support group aims to help heal and empower its participants. Members of the American Widow Project cheer at the end of an annual event in San Diego. 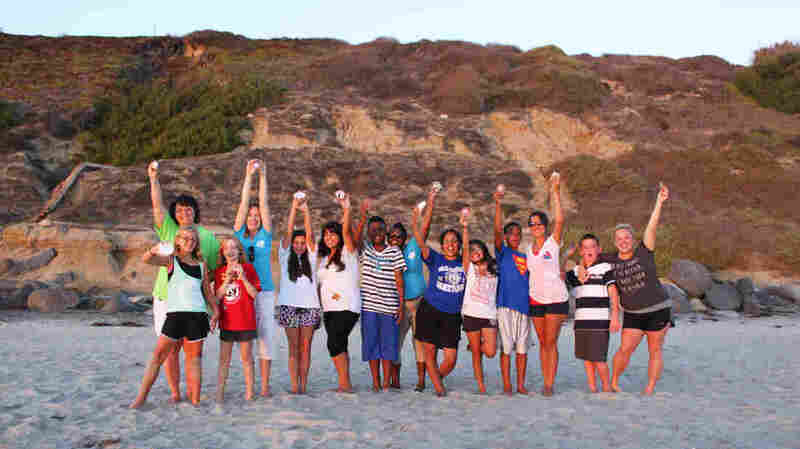 The organization's mission is to help heal and empower participants. In the kitchen of a rental house near a beach in San Diego, a group of moms is preparing dinner. The 13 women from all around the country have one thing in common: They lost their husbands in the Iraq and Afghanistan wars. They are part of the American Widow Project, a support group for women whose husbands were killed in Iraq and Afghanistan. The Defense Department estimates there are more than 3,200 military widows and widowers from those wars. The women gather once a month in small groups for bonding and adventure. On this weekend, they're at the beach. For 34-year-old Danielle Schafer, much of the day she learned that her husband had died remains hazy. Just because that war is over, it doesn't mean that ours is over. Like, our journey is still continuing. "July 25, 2005, two men came to my door, both of them were standing there, and they said, 'Are you Mrs. Schafer?' " she says. She remembers a chaplain taking her 3-year-old son into another room. And she was certain the men at the door had made a mistake. "The denial was even more because I had just talked to him that night," she says. Her husband, Army Staff Sgt. Michael Schafer, was stationed in Afghanistan. He would often call her before he left on a mission, but there was something different this time. She told him to call or message when he got back and to stay safe. "And I never told him to stay safe, so the fact that I did I felt for so long like if I wouldn't have just said that it wouldn't have happened," Schafer says. In 2007, Erin Dructor's husband, Army Sgt. Blake Stephens, was in Iraq. He too called her the night he died, but she didn't pick up in time. "For some reason I didn't answer the phone, and he left me a voicemail," Dructor says. "And I still have that voicemail, and I still listen to it 7 1/2 years later. I can't erase it," she says. "Just because that war is over, it doesn't mean that ours is over. Like, our journey is still continuing." The American Widow Project, the women say, is all about that journey. "There's a part of you when you are a young widow that nobody gets except for them," says Jessica Rozier, who was 22 when her husband died. Rozier and her infant son were living in a small town in Texas when her husband, Army 1st Lt. Jonathan Rozier, was killed in Iraq in July 2003. She says there are certain things only a woman who has lost a husband to war knows about. And she and the other widows have grown weary of hearing how much time has passed, and how they should just get over it. "I'm sitting here with tears in my eyes, so obviously there's some stuff that still hurts, and I'm 11 years out," Rozier says. She still remembers the day the Army sent her a package that she thought contained her husband's clothes. On the last night of the event, participants wrote on seashells words they had not had a chance to share with their husbands and fathers. At sunset, they returned the shells to the ocean. "We didn't get the clothes he was wearing back obviously, because they were bloody, but they told me they burned everything," Rozier says. "Well, one day I got a box in the mail." It was six months after her husband had died. Inside that box was a pair of boots. "I pulled them out, and I was so excited because they sent me his boots back and I — and this is so weird, but I buried my face in them and I couldn't smell him, and then I was like ... these are awfully small," she says. "Well, turns out those boots belonged to another soldier who had passed away." The American Widow Project welcomes about five new members a week, including surviving spouses of those who died on the battlefield and at home from suicide. Today there are more than 1,600 members — half the number of spouses killed in the wars. The project's mission is to help heal and empower participants. Rozier got her college degree and has a new job. Her son Justin is now 11 years old and attended the San Diego-area event with his mother. "I haven't been kayaking before," she says. "I'm terrified of the ocean. I've never been on a sailboat. "I may never get in the ocean ever again, but he was there with me the one time I did," she adds. 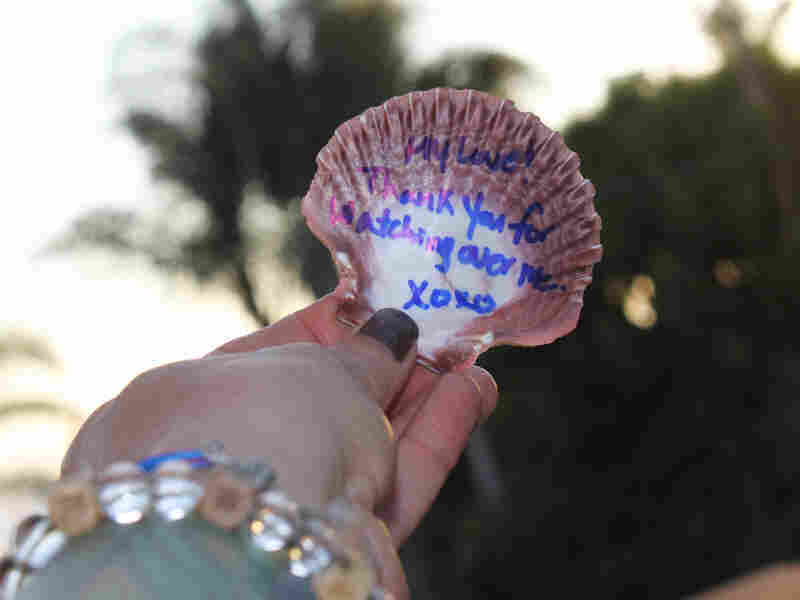 On their last night together, the moms and kids wrote on seashells words that they had not had a chance to share with their husbands and fathers. At sunset, they returned the shells to the sea.